I have purchased my fair share of shower bombs and while I like them, I didn't get enough of a spa effect to make them worth my money. When I found this inexpensive way to make them, I was hooked. These are super simple, plus a little time. I liked making these shower bombs because they serve a medicinal purpose. Every fall and winter I suffer from unending sinus infections which saps my energy. 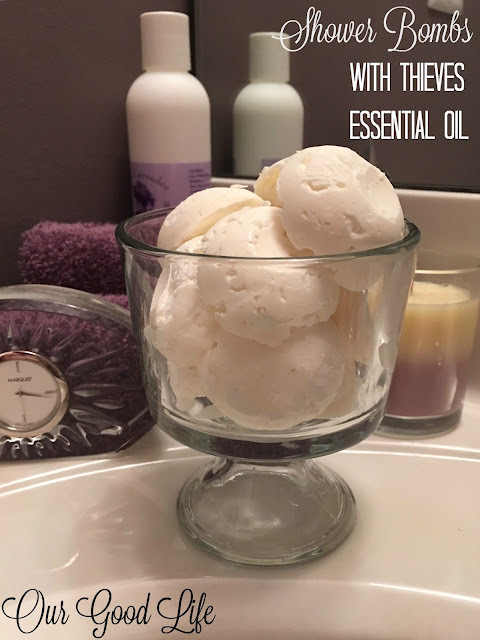 I discovered Thieves essential oils in the fall, which has tremendously reduced the inflamation in my nose. I diffuse the oil at night but sometimes I feel like I need an extra boost for the daytime. That's when these shower bombs come in. I drop one of these in the bottom of my shower in the morning and the steam helps diffuse the oil in the shower and gives me a little boost during the day. Measure out the cornstarch. Drop in the oil and mix using a fork. Add in one tablespoon of water and mix, and continue to add water one tablespoon at a time and mix. I added enough water to pack it into a ball shape. Once mixed, spoon mixture into molds. Place into freezer and freeze. When frozen, pop from mold and store in a cool, dry place. When ready to use, turn on shower until steamy. Drop bomb onto shower floor and let melt. The oil will escape into the steam. Inhale deeply. You can make these for energizing (use peppermint oil), for relaxation (lavender), and other purposes. These are super inexpensive (my ingredients cost less than $2.00 for 12 bombs.) Package in a variety of ways for gift giving, two will fit into a small mesh bag available at Hobby Lobby or Michaels. It is a thoughtful gift for any friends who suffer from sinus infections or allergies.